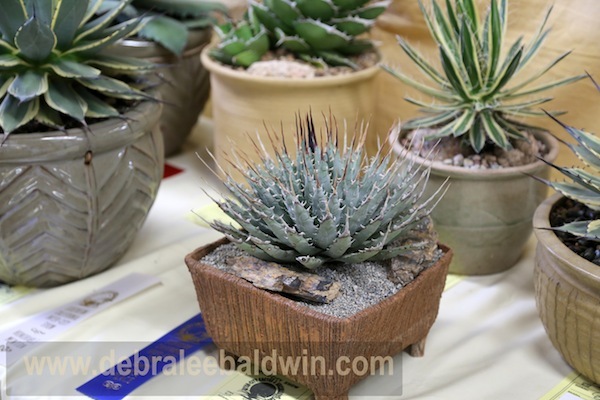 To see amazing succulents in elegant art pots, attend a Cactus & Succulent Society Show. 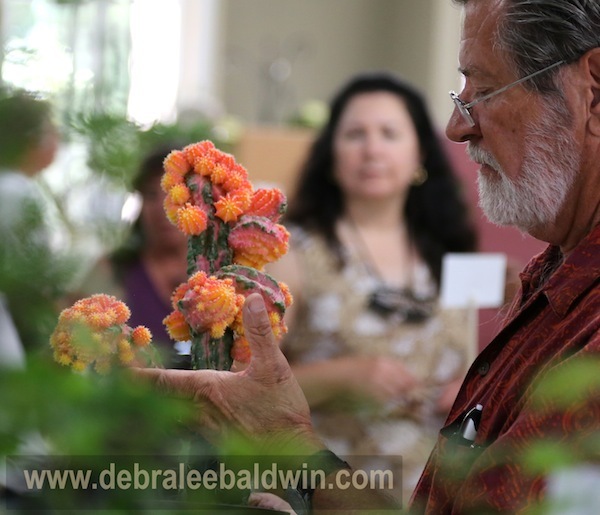 The largest in the US is the annual Inter-City Show at the Los Angeles Arboretum mid-August. 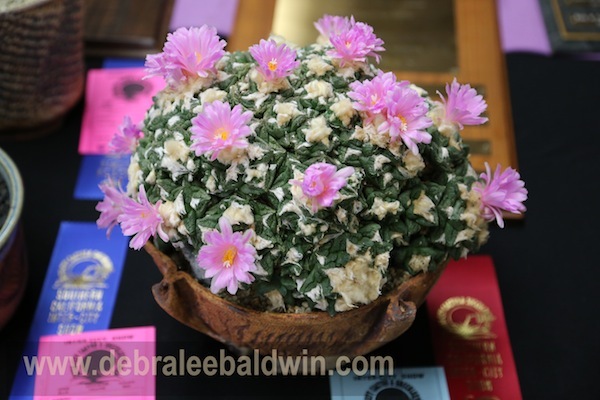 Judges award ribbons and trophies based on how well a specimen is grown, its rarity, and how well it’s “staged” in its pot. Pots aren’t merely containers, they’re works of art, and may be more valuable than the plant. 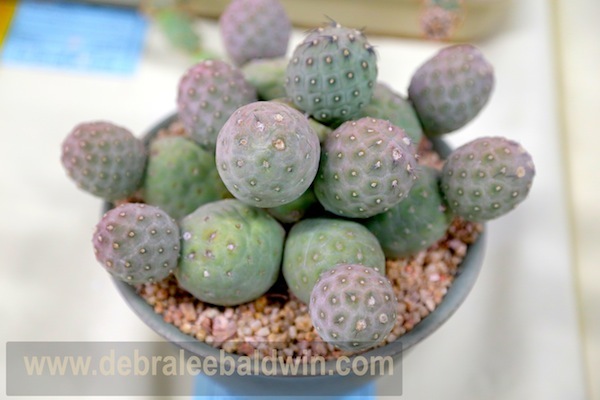 Below are what caught my eye and photographed well, but they represent only a fraction of the unusual and beautiful succulents on display. 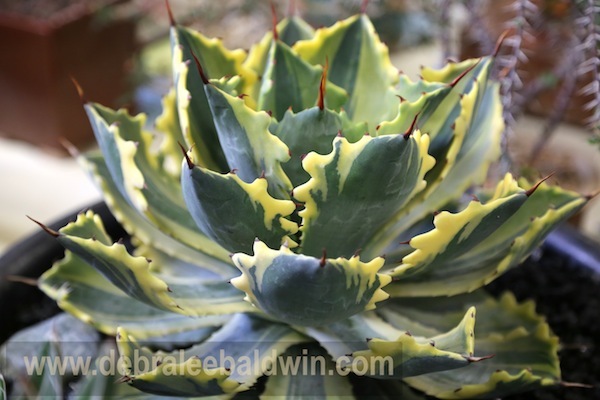 Above: Agave victoriae-reginae, named after England’s Queen Victoria. Above: A twisted cereus. Seriously. 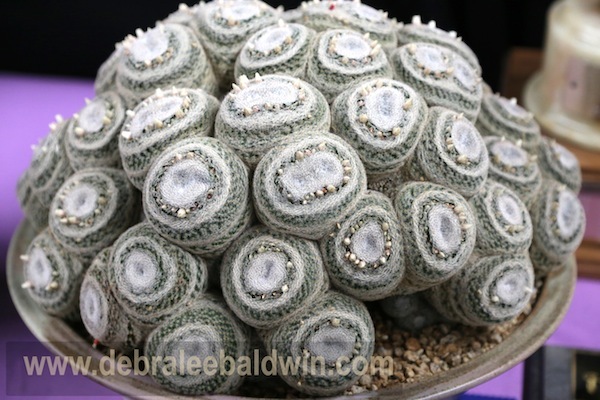 Above: Mammillaria microthele on the trophy table. Anyone for cinnamon rolls? 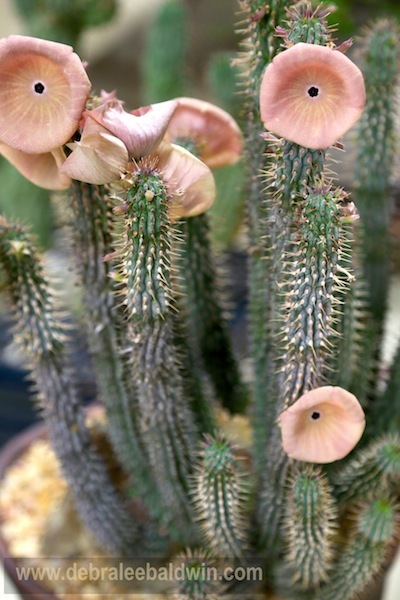 Above: Hoodia, the African cactus that’s reputedly an appetite suppressant. Not sure I’d want to take a bite, would you? 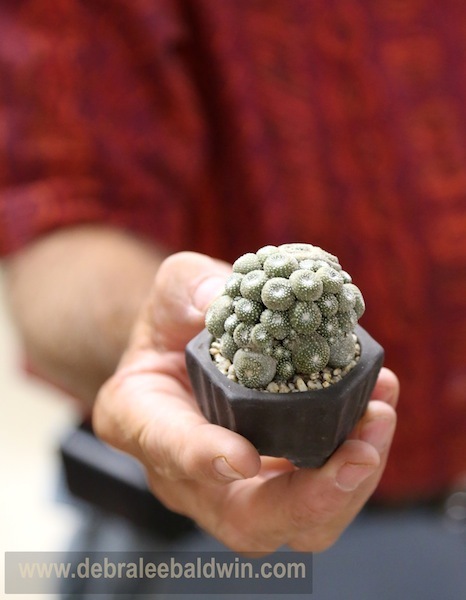 Above: Judge Woody Minnich examines an unusually colorful Gymnocalycium mihanovichii. 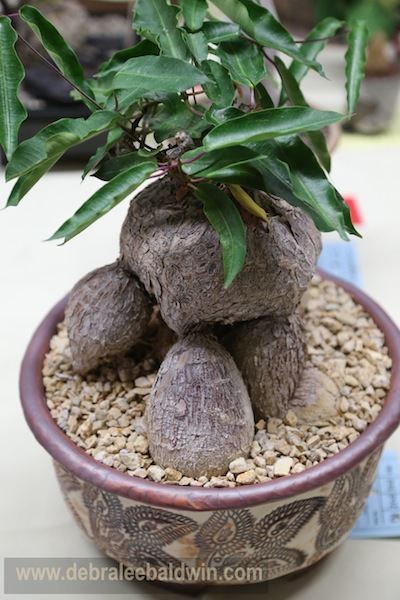 Above: A bonsai’d fig with its roots elevated in a Mark Muradian pot. His work is characterized by embossed patterns. 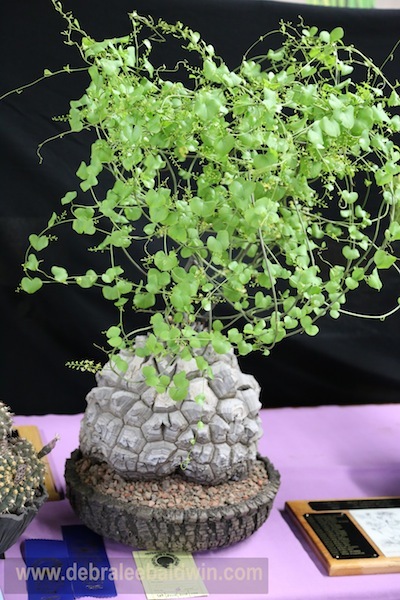 Above: Euphorbia gorgonis in a Mark Muradian pot. 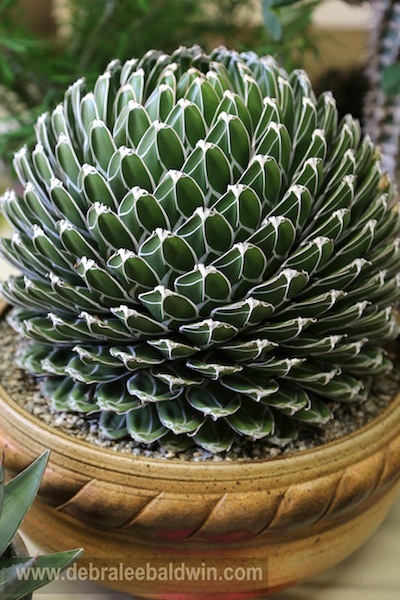 Notice the Fibonacci spiral in the plant’s center. 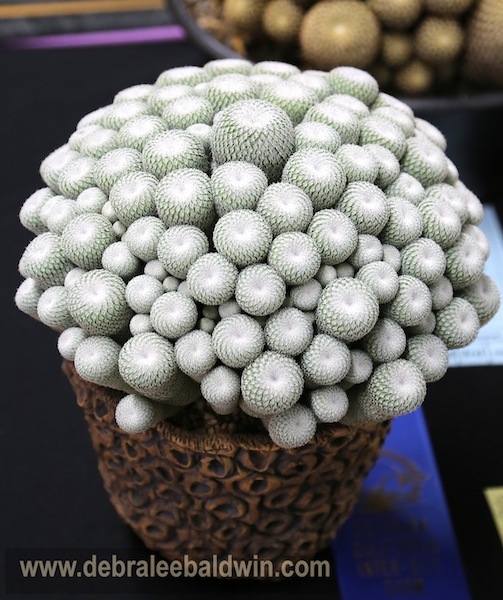 Above: An Epithelantha micromeris cluster in a container by Tucson potter Mike Cone. More spirals! 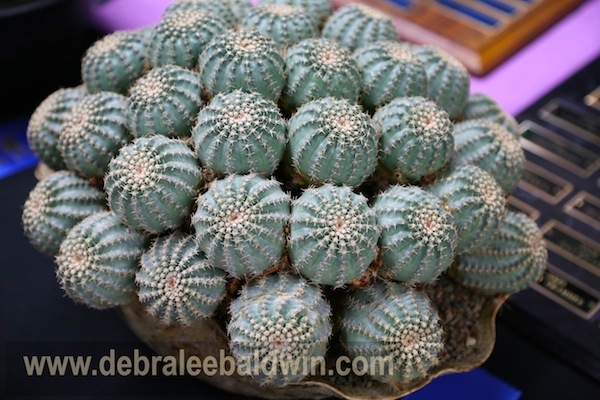 Above: Echinocereus pulchellus on the trophy table. If all this Latin seems tiresome, consider how it describes the plant. 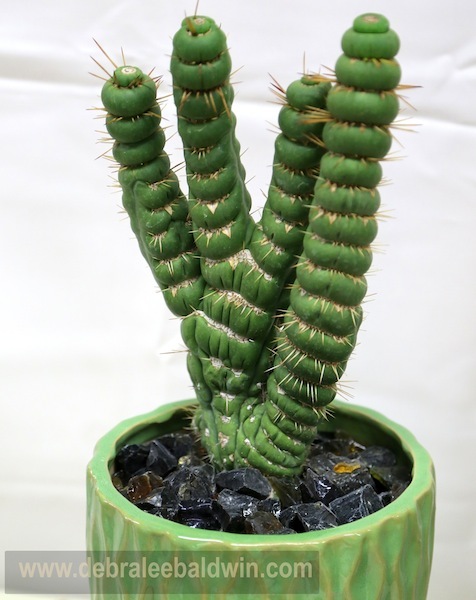 Echino = prickly, cereus = waxy, and ceroid cacti tend to be cylindrical. Pulchellus you’ll remember if you took Latin in high school—it means beautiful. 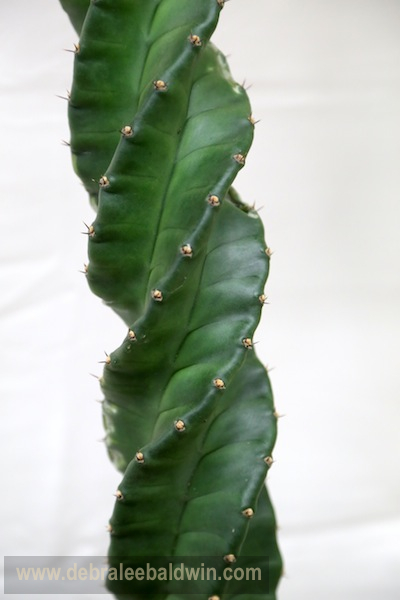 A twisted cactus, Eulychnia castanea spiralis. Don’t you wonder how and why it would do that to itself? Ow! 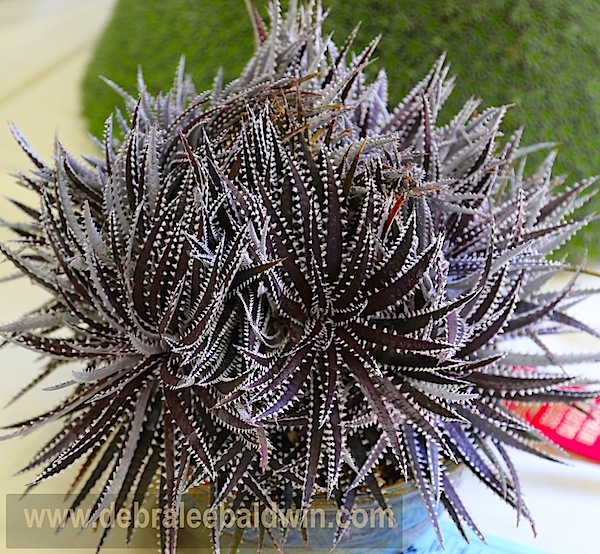 Above: A dyckia. I’m not sure why these bromeliad relatives are in the show, but they’re certainly beautiful. And treacherous. Those stiff leaves are like serrated knives. Above: A Dioscorea elephantipes on the trophy table. 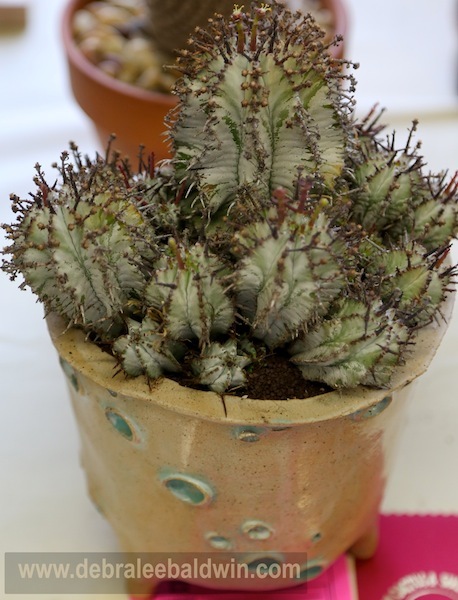 The plant is owned by Keith Kitoi Taylor of the Sacramento Cactus & Succulent Society, who also created the highly textural pot. 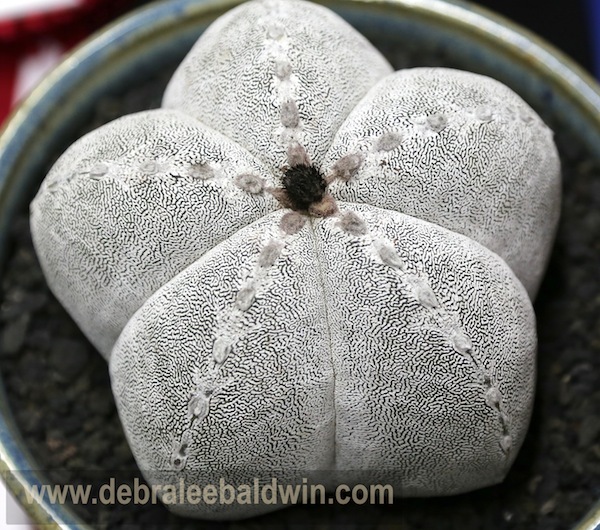 What makes this a succulent is the plant’s woody caudex, which is a water tank. The vining foliage is deciduous. 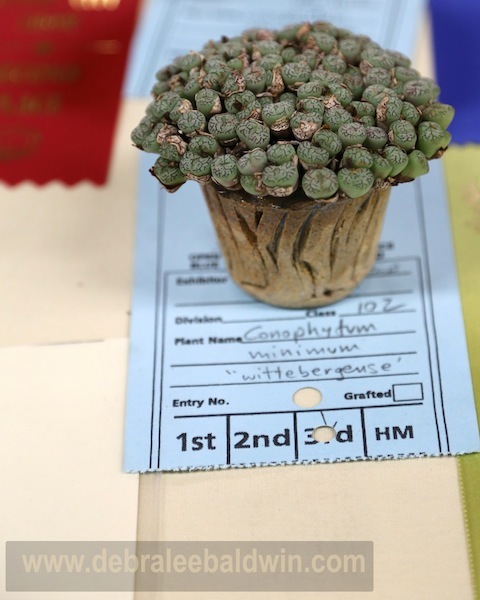 Above: Conophytum minimum. Sure wish I could get my hands on a few of those muffin-like pots. 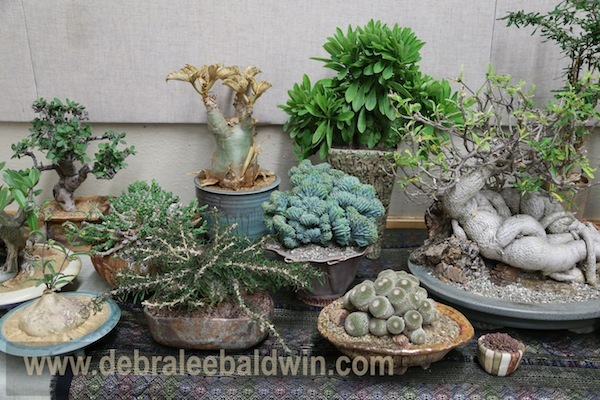 Above: Euphorbia horrida in a Mike Cone pot. Above: A display of collectible plants in one-of-a-kind pots, presented byCalifornia Cactus Center in Pasadena. 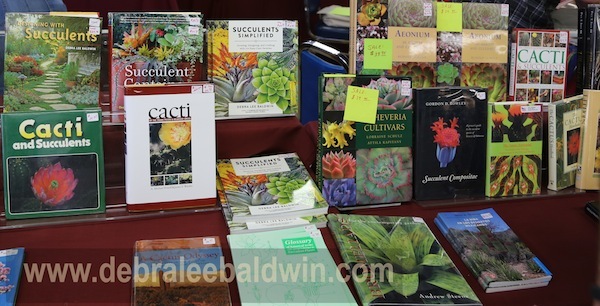 Above: I was happy to see my trio of books for sale at the show (upper left). This diminutive Blossfeldiana liliputana is rare and difficult to grow. It made it to the trophy table, and is from a teen-age boy’s collection. 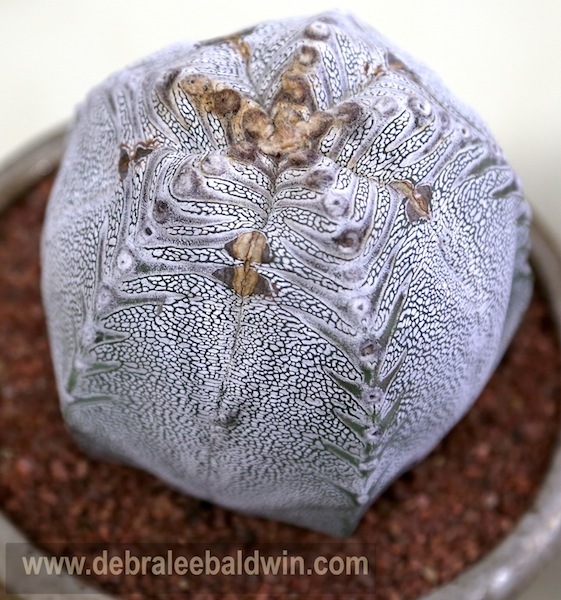 Above: A prehistoric-looking astrophytum. The name means star-shaped. Above: Another astrophytum. Don’t the lines in its skin look like those of a computer chip? I wonder what it might be trying to tell us. Above: Best of show, an ariocarpus in bloom. These cacti, native to limestone hills of Rio Grande in south Texas, are endangered in the wild and notoriously difficult to cultivate. 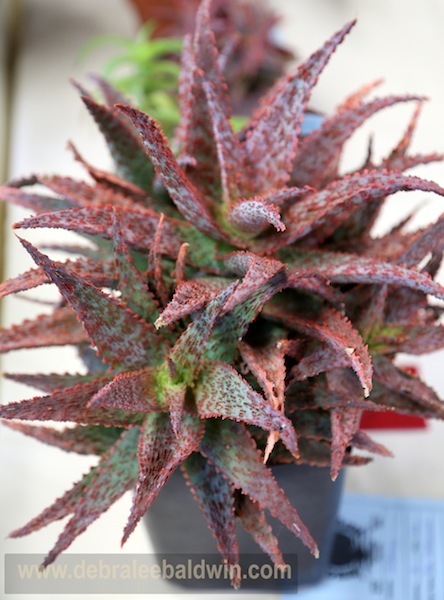 Above: An aloe hybrid developed by Tim Harvey, who edits the journal of the Cactus and Succulent Society. This plant is not for sale, nor is it available in any nursery; hopefully it will be some day. 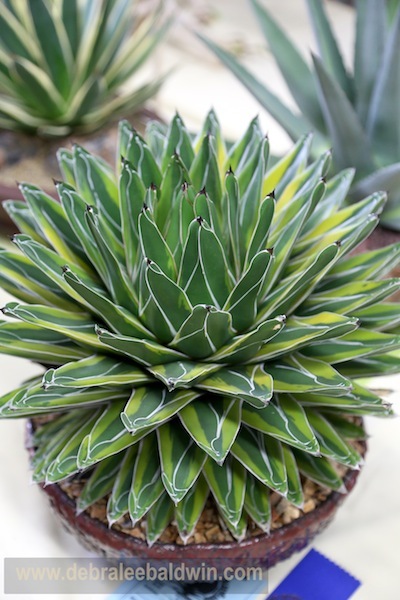 Above: Agave utahensis, from–no surprise–Utah. It’s one of the most cold-hardy agaves. Don’t you love its long terminal spines? Above: One of the smallest agaves, Agave pumila. Notice its blue color, wedge-shaped leaves and delicate striations. Above: Of all the plants in the show, this was my favorite because of its deeply indented sides, rust-colored spines and variegation. 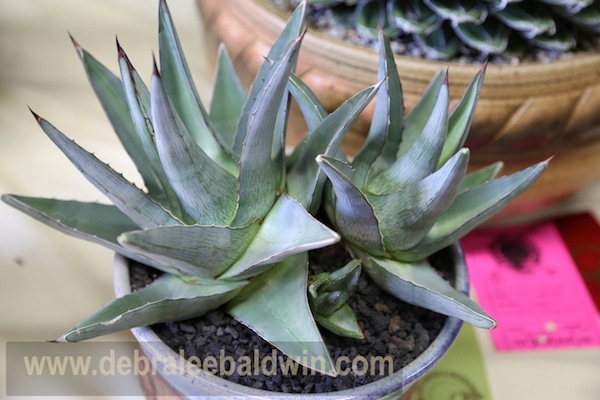 It was entered by agave expert Tony Krock of Terra Sol nursery in Santa Barbara, and is an Agave potatorum hybrid. The three-word cultivar name is Japanese and wasn’t translated on the tag. Anyone know what ‘Ikari Rajeh Nishiki’ means? 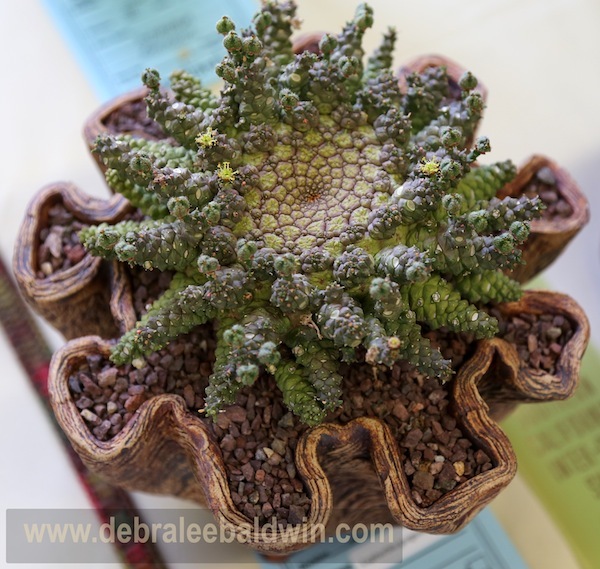 It’s also possible to purchase collectible succulents and containers at the show. 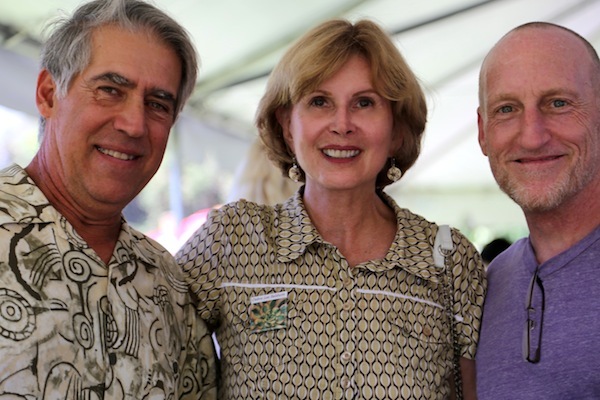 Here I’m with the two potters mentioned above: Mark Muradian (left) and Mike Cone (right). Photo by Jeanne Meadow. They can outgrow some pots, but Even people with brown thumbs can grow prickly pears (Opuntias). There are dozens of varieties to choose from. Short. Tall. Wide. Narrow. I put my plants outdoors on the porch in summer and they are happy as can be. In the fall I bring them in and mostly don’t water them. They sit dormant in my living room window. Thanks, Joe. Love your website! Thanks for getting the word out about this fascinating genus of succulents. Have you checked with your local Cactus & Succulent Society? There’s also Steven Hammer (Google him).